Some plants survive on neglect with dull and wrinkled leaves, while others seem to glow. Such is the case with this dazzling living flower arrangement that I planted last fall with 'window leaved' Haworthias and a flaming orange 'Wild Tiger' bromeliad burning bright in a bowl of black sand. 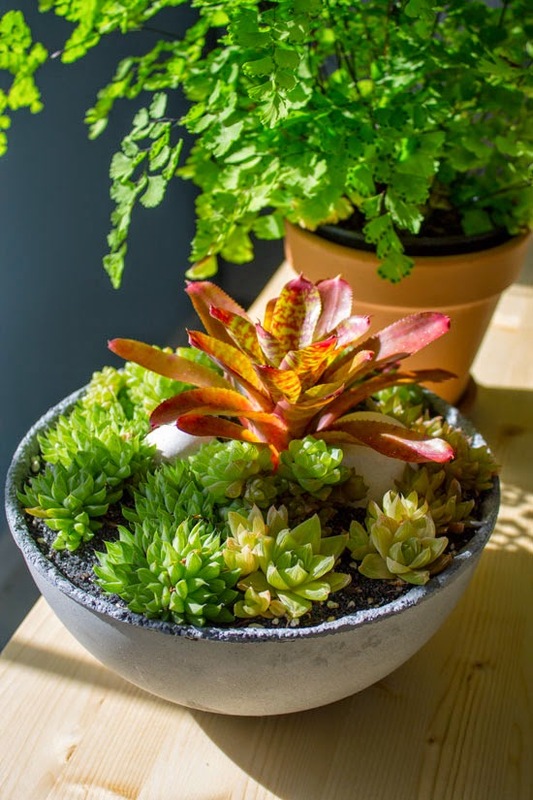 This combo thrives both indoors and out with lots of sunlight and casual watering. Here's how to make your own in 15-30 minutes. I combined these plants for the way their leaves capture sunlight like living stained glass windows, but they are also very drought tolerant and readily adapt to life between my patio and living room. Whether they get a sunlit windowsill or my intensely sunny patio, these plants continue to shine. This is how the container planting looked last fall when it was first assembled from little Haworthia offsets and a miniature neoregelia that I had neglected for about a year. Each of the plants originally resided in some of the container combinations featured in my book Plant by Numbers: 50 Houseplant Combinations to Decorate your Space. Below is a picture of how it looks today, several months later. Isn't it amazing how quickly the little succulents have filled the pot? 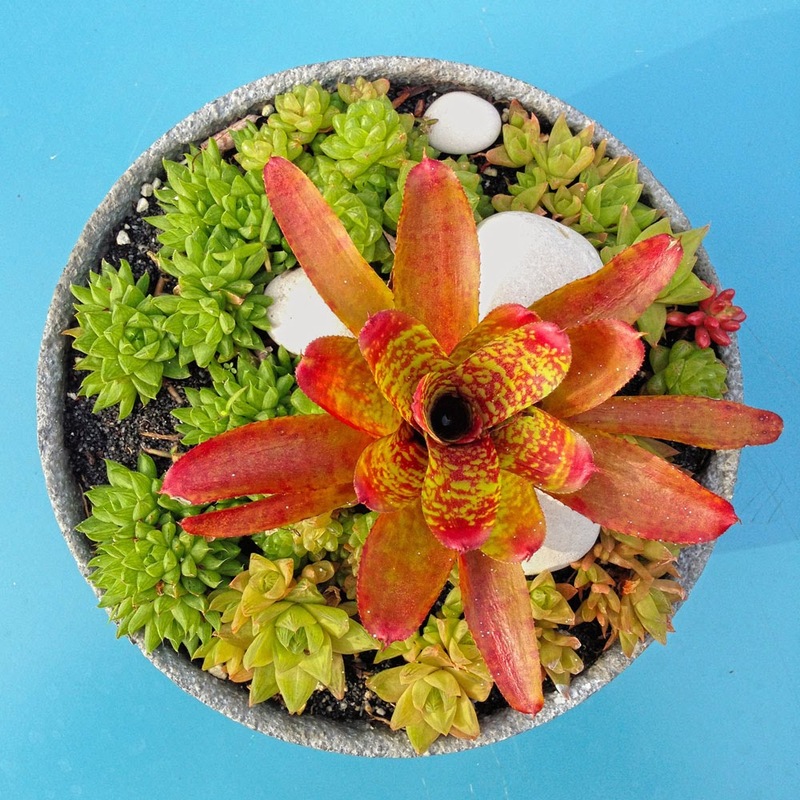 Thanks to a sunny spot on the patio, the bromeliad has colored nicely and the Haworthia have formed tight clusters. Want to make your own? Here's how I did it! - One bowl shaped container - I used a Nativecast concrete bowl, but all that matters is that the bowl has a drainage hole. - Potting mix - Cactus mix is best for succulents but you can add vermiculite or perlite to regular potting mix. - Sand or other topdressing - I used black sand to highlight the glowing leaves. 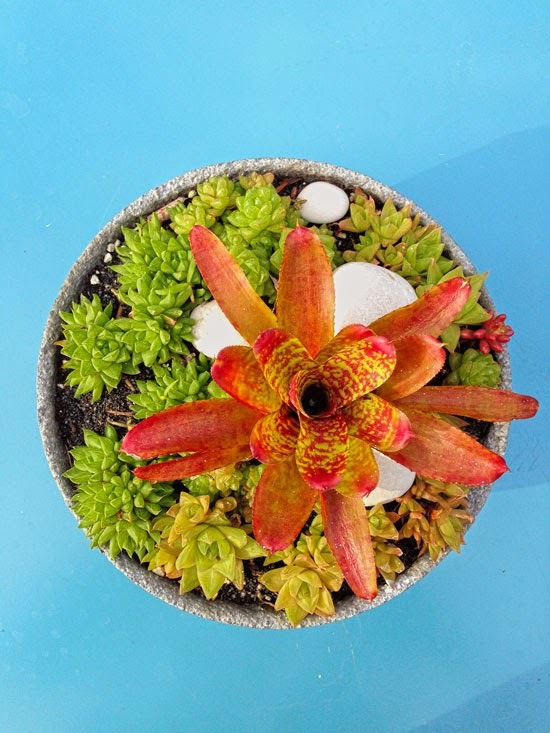 - One small bromeliad for the center - I used Neoregelia 'Wild Tiger', a miniature Neoregelia, since bromeliads pair well with succulents. The specific plants I've used are great choices, but you can get the same effect with different plants as long as you use a similar design. All you need is a combination of A. an architectural plant as the centerpiece and B. a groundcover of smaller slow growing succulents. If you're trying to find a succulent that's as shade tolerant as the Haworthia, Gasteria is another South African genus with lots of shade tolerant plants from which to choose. The bromeliad may be replaced by a medium-sized succulent such as Agave lophantha or one of the smaller Aloe cultivars. If a larger plant is used, just use a larger pot to accommodate it. 1. 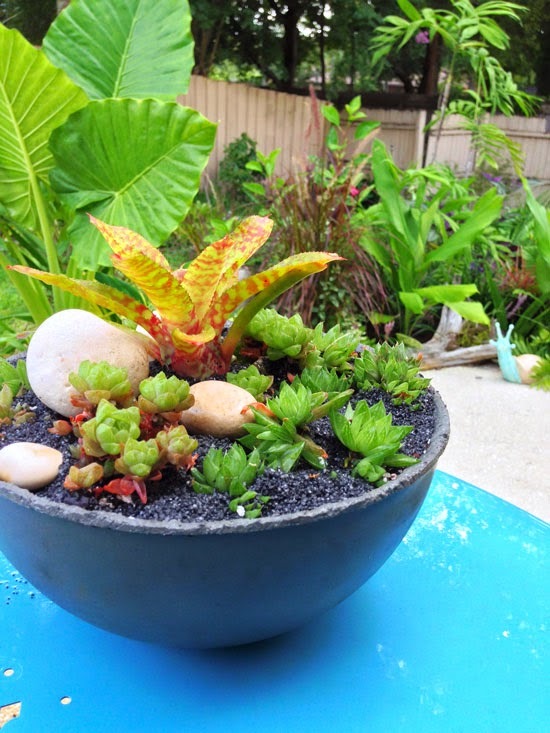 Fill Bowl with free-draining potting mix, leaving about 1-2 inches space for plants and sand. 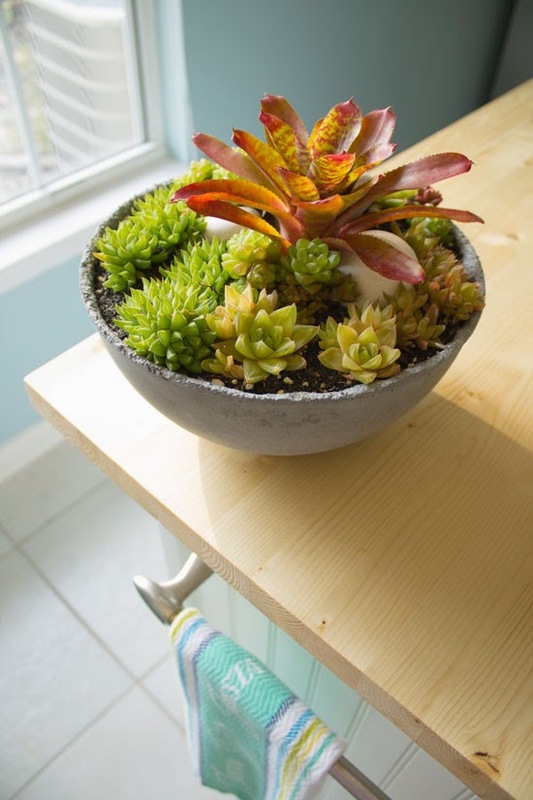 You can either use cactus mix or amend a regular potting mix with perlite or vermiculite. 2. Add Plants, arranging them as you choose. Start with the centerpiece plant , mounding more potting mix around the roots. Repeat with other plants, leaving enough space for a topdressing of sand. 3. Add Topdressing of sand, gravel, rocks, marbles... you name it. Add additional accents like rocks, shells, figurines, etc. if desired. I used a few white river rocks. There isn't much to do where care is concerned, but here are some tips. Water it twice a week, weekly or forget about it for a couple of weeks. 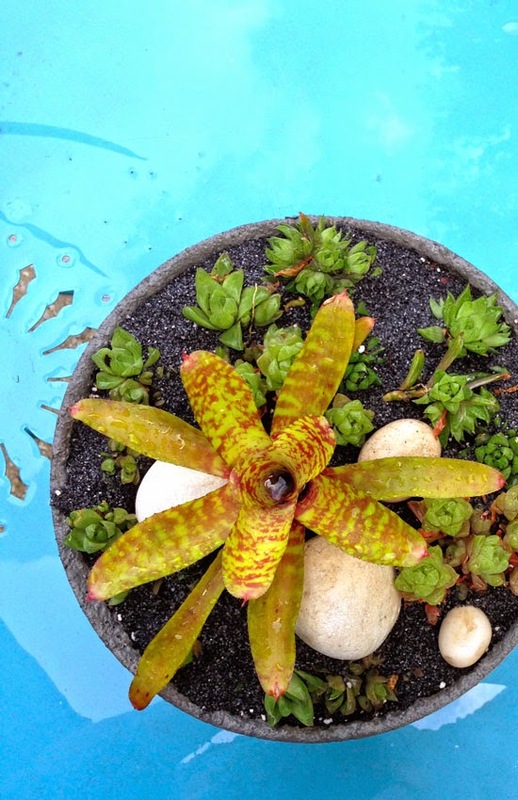 There's an easy way to know when to water if you used a bromeliad: When you water the plants, pour the water in the bromeliad's cup and let it overflow to water the other plants. If you notice that the water in the cup has dried up, it's time to water again. 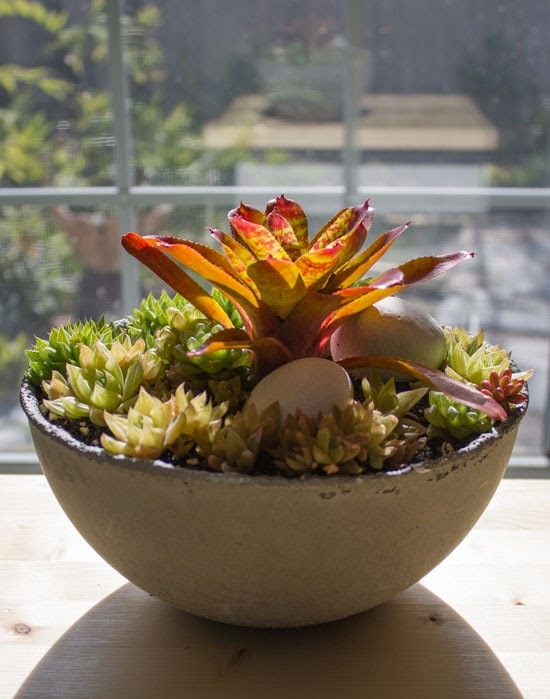 You can fertilize lightly once a year if you'd like, but don't overdo it since bromeliads and Haworthia color best with less fertilizer. When the plants' roots have filled the pot and the Haworthia hang over the edge you can either upgrade to a larger pot or divide the mass and replant. After the Haworthia blooms, you may remove the bloom spikes for a tidy appearance. That's it! Let me know if you have any questions, or just refer to my book Plant by Numbers: 50 Houseplant Combinations to Decorate your Space to learn more about making your own combinations and giving them the proper care. Succulents are my new favorite plant! Beautiful flower arrangement! 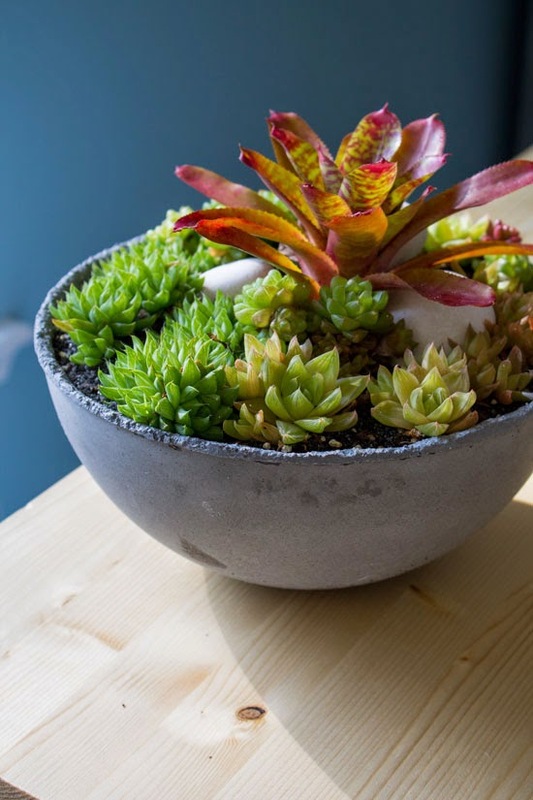 My mother loves succulents and this could be a nice surprise for her.Thank you for sharing this idea!